Brief Description Visit this retired freighter and explore the pilot house, crew quarters, and cargo holds. Description Launch your tour of the Soo from this retired cargo freighter at the river's edge. With more than 100 exhibits, you'll also get a closer look at lighthouse lenses, a photo tour of the 1000-foot freighters on the upper Great Lakes, and an unforgettable look at two lifeboats from the S.S. Edmund Fitzgerald. A series of aquariums featuring fish of the lakes, complete with interpretive signage, is a fascinating stop for visitors of all ages. Suitable for all ages, plan to spend at least 90 minutes on board and leave enough time to visit the Ship's Store gift shop located just off the parking lot. 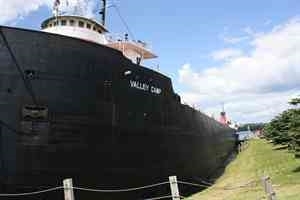 Add Museum Ship Valley Camp to your free online travel itinerary.